Quinoa is a whole grain and may seem uncommon to you, but it has been used for centuries by the peoples of Peru, Bolivia, and Ecuador. History tells us that quinoa has been used by the Incas of Peru for 5000 years. It was considered sacred and was called the “mother grain” because of its ability to sustain life. Some soldiers live off of quinoa with some added fat during times of war. Quinoa is high in protein. It has all the essential amino acids; which make it a complete protein. To give you an example; rice and beans together are a completer protein but quinoa is complete all by its little ole’ self. And, when I say little, I mean little. The grain is so small it looks like a seed. It is hard to believe what a powerhouse of nutrition it has in it. Quinoa is also gluten free, is high in iron, magnesium and fiber. 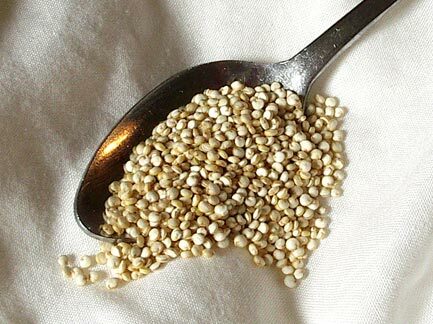 A cup of quinoa has more calcium than a quart of milk. Many people feel it necessary to rinse off the grain before using it. It is probably a good idea but the grain is so small that I have a hard time messing with the rinsing. But, it is said that rinsing it off removes a slightly bitter coating. Quinoa can be slightly toasted and cooked for 15 minutes in boiling water. You don’t have to toast the grain if you don’t want to. I, however, think it makes the flavor even better. Now that we know the virtues of Quinoa, what’s the best way to use it? Surprisingly, there are many ways to use this fabulous grain. This nutritional grain can be used as a breakfast cereal, in salads, soups and added to your bread recipe or it can be used as a side dish by itself. It tastes great cold on a salad so there is no reason not to use every last drop. When using quinoa on a salad make sure you use a light dressing, such a lemon juice and olive oil, to really enhance the flavor. My daughter-in-law, Stephanie, has a great cookbook named “Good to the Grain” by Kim Boyce and Amy Scattergood. Using a recipe from the book, she made some quinoa and beet pancakes. They are a brilliant pink and do not taste anything like beets. They were beautiful to look at and very tasty. The preparation time was minimal except for the roasting of the beets. I would suggest doing them ahead of time. The author suggests occasionally using these pancakes as a savory dish called blini, with smoked fish and sour cream. If you are making blini, take out 2 Tablespoons of brown sugar from the original recipe. I have only tried this recipe as pancakes with maple syrup. 1. Preheat oven to 400 degrees. Place beets in a glass or metal baking dish with about a half a cup of water in the bottom. Cover with aluminum foil and roast until very tender, about 1 hour. Cool, peel and purée the beets in a food processor or blender until smooth. You will need ½ cup of beet purée. Freeze the remaining purée for another time. 2. Sift the dry ingredients into a large bowl, pouring back in any bits of grain or other ingredients that may remain in the sifter. 3. In a medium bowl, whisk together milk, yogurt, melted butter, egg and ½ cup of beet purée until smooth. Using a spatula, add the wet ingredients to the dry ingredients and gently combine. The batter should be the consistency of lightly whipped cream and crimson in color. 5. Heat a 10 inch skillet over medium heat. Rub the pan or griddle generously with butter – this is the key to crispy, buttery edges. Drop ¼ cup mounds of batter onto the skillet and spread out a bit. Once the bubbles begin to form on the top side of the pancake, flip it over and cook until the bottom is dark golden-brown, about five minutes. Wipe the skillet with a cloth before cooking more pancakes. Re-rub the pan with butter. 6. Serve pancakes hot off the griddle with warm maple syrup. Add dried fruits such as chopped dried apricots, dried cherries, craisins, raisins, dried blueberries, nuts or fresh fruit. Serve with syrup, honey, brown sugar or whatever sweetener you like. Serve with milk, if desired. In a medium sauce pan over medium heat, sauté the pistachios for 2 minutes. Remove nuts from pan and let rest on a paper towel. Add the onions, ginger, garlic and apricots to pan, stirring constantly for 2 minutes. Add broth and bring to a boil. Stir in quinoa and parsley. Reduce heat to low and simmer for 20 minutes or until liquid is absorbed. Remove from heat. Fluff with fork and fold in pistachios and pinch of nutmeg.